Travel articles written by a blogger who has visited all the continents except Antarctica. M Gravlee is a retired newspaper publisher who spends several months a year traveling. Over the years I have visited every continent except Antarctica and over 30 countries. I try to be a traveler, not a tourist. I started Travel on the Tide in 2008 to help readers discover more about the places they are considering for travel. You can have new articles from Travel on the Tide~ sent to your inbox... just enter your e-mail address here and you'll get an e-mail whenever I post a new entry. And don't worry, I hate spam more than you do. I'll never sell your email address and you can always unsubscribe anytime you wish. No trip to Colorado would be complete without doing a little bit of Kayaking on the famous Colorado River. The only problem in my case was that we had never done such a thing before and had no idea how to even go about doing it. After setting up our camp for the next couple of evenings we proceeded to check out the other camps that we saw around the area. The people were friendly and a few of them were even planning to do a little kayaking themselves. When they saw that we expressed an interest in the activity as well, the conversations began to flow even easier. I explained to them that we were basically a kayaking greenhorns and after the laughter cleared they explained that many of the people who arrive in the area had never before been in a kayak so the idea was not foreign to the class instructors. They explained where we could go to receive beginner instructions and even to rent the necessary equipment for the trip. That afternoon we followed their instructions and approached one of the many kayak training centers around the river. The owner understood completely what my predicament was and offered many valuable suggestions. Within his shop were a vast array of gear designed specifically for kayaking and upon leaving all we had to do was bring a swim suit and a towel. The lessons were scheduled to begin the following morning and we arrived bright and early waiting patiently for our instructor to get to work. The kayaking lessons covered safety on the water, paddle skills that are required as well as the necessary outfitting techniques for this water sport. My classes were conducted with what is generally referred to as a “duckie”. These are nothing more then inflatable kayaks which are used exclusively for the training classes. we must admit that we often times felt a slight bit silly taking the same classes that several 11 year olds were completing but at least we were learning the fundamentals properly. In case you are wondering about the location of the classes. We were not actually taking our classes on the river but rather in a very large pool. Colorado offers kayak classes year round and uses common swimming pools as a place of instruction. According to when and where you sign up you can perhaps find classes that are developed for group instruction, a one on one tutoring or like we did in the open pool session which was available for everyone. The instructors were well certified in whitewater kayaking and the program was more then adequate for our needs. If we had been more experienced we would have signed up for the more advanced courses. Who knows maybe the next trip we will further develop our kayaking skills. If interested, please contact me at: dadan_agt@yahoo.com to discuss further. Thank you. I'd love to take the kids camping and kayaking. I'm hoping to have a tent by spring '10. We have a nice park nearby for camping. Kayaking will have to wait until the kids are a little older. Love your blog. You've got some really good information here. So many travels - I like your blog, it's very interesting. man ! that sounds dangerous! As far as I understand, the colorado river is one of the most difficult ones even for pro´s but it seems like you made it to write this post so it´s all good ! i've done some kayaking before and it was so much fun. You are so right in getting instructions first. Hope you'll enjoy your next kayak trip more. Thanks. Nice information here. And really good advice here. I will contact first at training center. Thanks for the tips. These are very helpful. I actually bookmarked this site out. Very helpful indeed! Created and maintained by Vacation and Travel Guide . 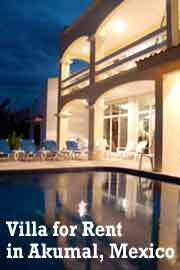 Copyright © 2000-2010 Akumal House for Rent.